We analyze the stability of the ball motion with linear deviation dynamics (see impact location deviation example on the stability page). 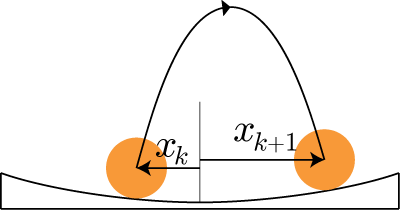 The real dynamics of a ball bouncing on a plate are nonlinear, however. Nonlinear dynamics are more difficult to analyze, but also more interesting than linear dynamics. In this section, we discuss some properties of nonlinear dynamical systems that we also observe in experiments with the Blind Juggler. An excellent book, which covers the material discussed here in greater detail, is Steven Strogatz’s “Nonlinear Dynamics and Chaos”. Think of as a number describing the dynamical system we analyze (in technical terms, it is called the state of the system). For the Blind Juggler, could be the impact location of the ball on the paddle. The index counts the number of impacts, and is some number, for example . The equation then reads: “The impact location at impact is times the location at impact ”. It describes how the impact location changes between two consecutive impacts. On the lower axis, the impact location at the -th impact is shown. We can look up what the next impact location is by finding the value of a colored line on the left, vertical axis. Each color corresponds to a different and describes a different dynamical system. The blue line, for example, corresponds to the equation . The thin black line is where . We can use this line to find the fixed point, which is where the black line intersects with the colored line. The intersection is clearly at for all . We can also use the black line to visualize how the system evolves over time. Let’s see how that works out for the green system dynamics, where . We start with and find the point on the green line for which . This point is also marked in the figure with . To find the next value of , we draw a horizontal arrow from the point to the black line, and then add a vertical arrow back to the green line. That gets us to . Doing this over and over again, we realize that we will approach , the fixed point of the system. This is because the fixed point 0 is stable for , since is smaller than one. We discuss this fact in more detail at the end of the stability analysis. As an aside: set , and the line describing the system dynamics coincides with the black line. Therefore, any is a fixed point and therefore the system has an infinite number of fixed points. Linear systems are quite straightforward to analyze. To find the fixed point, we need only find the intersection of two straight lines, and we can immediately tell if the fixed point is stable or not by inspecting the parameter . We will see in a second that this is not straightforward for a nonlinear system. We see that the red dashed line is actually a pretty good fit to the green line. 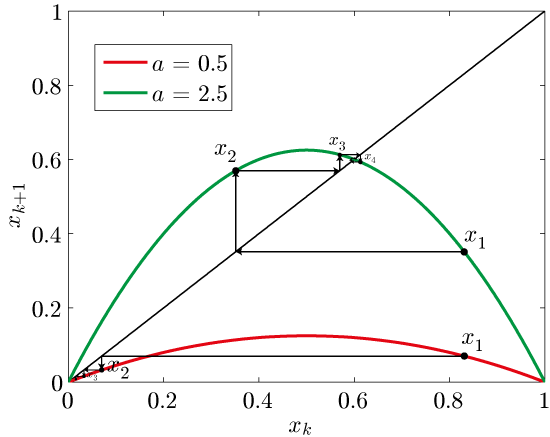 Therefore, the linear dynamics described by the dashed line are a good approximation to the green, nonlinear system dynamics. For small deviations of from the fixed point, it is almost perfect. 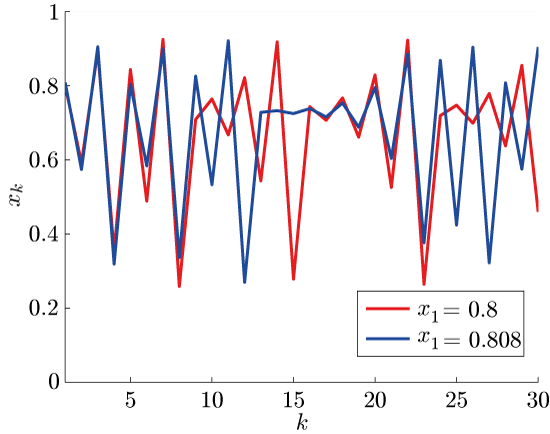 This is exactly how we can analyze the stability of a fixed point of a nonlinear system when deviations are small: We approximate the nonlinear dynamics by linear dynamics, and then analyze these dynamics. This process is called linearization. This is what we did to analyze the stability of the ball motions: We linearized the nonlinear dynamics of the impact locations, assuming the impact locations are small, and then analyzed the resulting linear system dynamics for stability. Since -0.5 is not smaller than -1, the linear, approximated dynamics are stable (see the stability page why larger than -1 is key). Immediately, we also see why the fixed point at 0 of the green system is unstable: The green line is well above the black line. The black line corresponds to linear system dynamics with , where stable linear systems turn unstable. 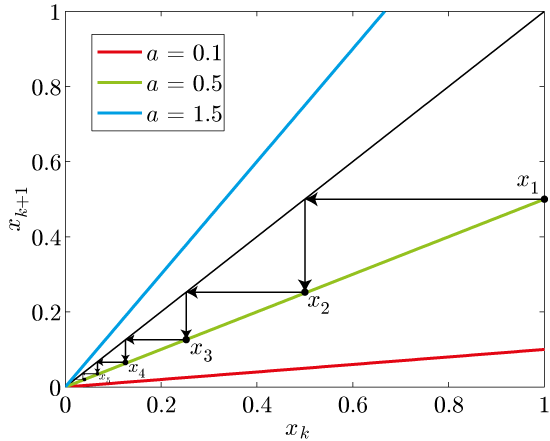 Therefore, we see that the linearized green system at the 0 fixed point has an that is larger than 1, which indicates that this fixed point is unstable. The value of repeats every other on this orbit. Therefore, the period of this orbit is two (fixed points are a special class of periodic orbits with period one). Lastly, we find that this periodic orbit is stable: If we start the system close to the orbit, it will converge to the orbit, just like with the stable fixed points earlier. With the Blind Juggler, we can also find multiple stable periodic orbits. For every , we search the values of that are part of a stable periodic orbit of the system. Then, we mark all these points with a black dot. For example, recall the dynamics for , we found a single stable fixed point at . Now check the above figure: If you go up from the location on the bottom axis where , you will hit the black line exactly at . That means that if we increase from 2.4 to 2.8, the fixed point also increases, from slightly below 0.6 to about 0.65. You can also see that strange things begin to happen as gets larger. Between 2.4 and 3.0, things are not yet very special; there is only a single stable fixed point. 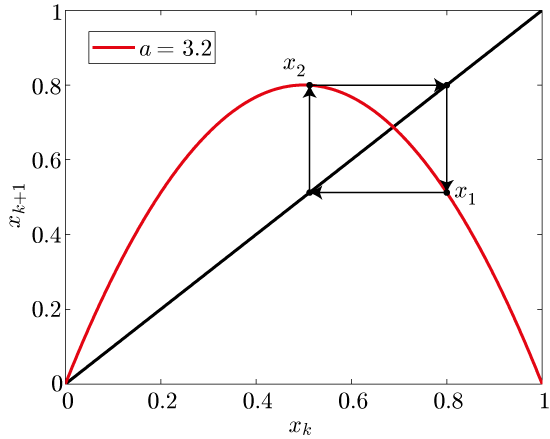 At about 3.0, the fixed point turns into a stable periodic orbit of period two (if you look at the shape of the curve there, it is also clear why this phenomenon is called a bifurcation). At about 3.45, the stable periodic orbit of period two turns into a four-periodic orbit. Further along, we find an 8 period orbit, then 16, and so on, until at about 3.6, the system goes completely bananas: it is now chaotic. The system is locally unstable: If you start the system from two values that are very close to each other, that small difference is amplified and the system quickly evolves very differently for the two starting values (this is illustrated below). 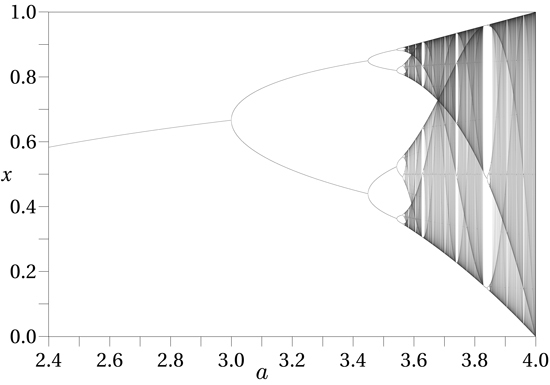 The figure shows the system evolution of the logistic map (a = 3.7) for two starting values that are very close to each other. The blue starting value is just one percent larger than the red starting value, but the system quickly evolves very differently. While the system is locally unstable, the system state does not get arbitrarily large, and remains near a specific set of values called the strange attractor. In the Bifurcation Diagram above, you see that for , the system won’t take any value between 0 and 1 as the system evolves. You will only find values that are black. These black values reveal the strange attractor. It is called an attractor because this black set of values for is stable: if the system starts close to this set (for example at 0.1), it quickly converges to that set of values. This is the same notion of stability as before with the periodic orbits, except that the “stable” motion is now more complicated. The word strange in the name stems from the fact that the set of system states that defines the strange attractor is usually not of integer dimension. Such a set could for example be neither a line (dimension 1), nor a plane (dimenison 2), but something in between. These sets are called fractals. Chaos can be very well visualized with the Cloverleaf Blind Juggler. Check out the chaos page!